We cannot help but learn to love some food things of our new home. That's the subject of my column this week. What are your favourites in your new home? This is a saltbread. It is used the same way as bun, sliced with goodies inserted. It makes a hearty snack because it can also be eaten by itself just spread with butter or jam. It's a rustic bread. The thing you see on top of it is a piece of coconut palm, placed on top of the dough just before going in to the oven; it causes the dough to burst, adding an even more rustic look. The baker said it also imparts a flavour, that I am not so sure about. I just love it. 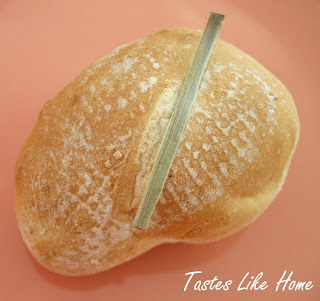 When a salt bread is sliced and something is inserted, it becomes a cutter. In this case, I have cheese in mine so it is a cheese cutter. 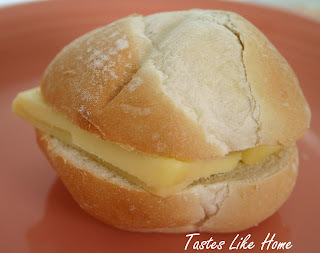 As a child, I loved eating tennis roll (similar roll in Guyana) with cheese and drinking cream soda flavoured drink with a splash of milk and ice. Ummmm so good. Especially after a long day at school. Rice and peas is an everyday staple in Barbados. It is considered authentic only when cooked with pigeon peas and a piece of salt meat, on the plate there I have a piece of salted pig-tail. 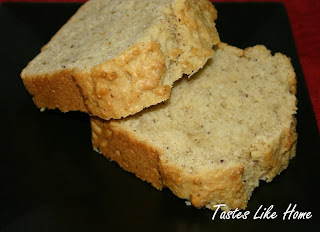 Sweet bread or coconut bread is good anytime, at breakfast, as an afternoon snack or an evening snack with a cup of tea. Moist, not too sweet, with the hint of cinnamon and of course, the coconut. What's not to love? 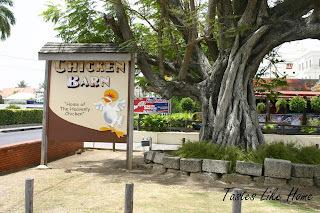 I love chicken and chips but don't indulge too often, when I do, like yesterday, I only have Chicken Barn's. Theirs is barbecued with a semi-dry rub. It is never slathered in sauce and that's one of the things I like about it. It has a great smokey, home-made kind of taste. Love, love, love it.